It was an odd weekend. Overcast and grey both days but wildly swinging from muggy and hot to bone-chilling in a single afternoon. Because it's a convenient scapegoat, I'm going to blame the weather on the general sense of malaise at the Taylor household this weekend... We were decidedly out of sorts, all four of us. The girlies were surly and snappish, which in turn made me surly and snappish. We were not in a good way to say the least. I struggle a bit with expecting too much from those girlies of mine. You see, they trick me with moments of such maturity and enlightenedness that I get thrown when they, well...act their age. Their world is swirling a bit right now, and they're having a hard time processing it all (rightfully so). I know this, but somehow I'm not doing a very good job acting on it. But knowing it is the first step, right? In the spirit of balancing the unvarnished honestly (so I don't completely bum you guys out), we did have a couple of bright spots. In particular, Bryan and I managed to carve out some time to meander awe-struck through the Gaultier exhibit at the DMA... it was utterly mind-blowing. I also unearthed a trove of new brass bits, inspiring a bout of relatively drama-free necklace making with the girlies (we're hoping to have our little online shop up next week). So some goodness to temper the less than stellar moments. p.s. -- In other fun Monday news, there's a little interview with me up on Momfilter today... so, so honored to be in that space. Thanks Jamie! Loving the necklace & that sweater (please share who made it :) ) ! I find myself doing the same thing. Expecting them to be adults when they are only wee ones- 7 and 4. There have been many times when I'm clearly the one in need of a time out. Interesting mug...interesting that the handle is placed so far down. Loved the piece on momfilter! and we are battling sickness around here. I think the change in weather is not good. It got really cold over the weekend, 20's overnight now, and it's been rough on the whole crew. Always love your honesty! Can't wait to shop the site!! 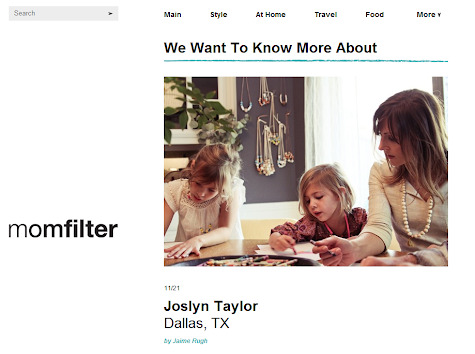 Congrats on the piece about you in MomFilter! such a pretty and fun necklace!